My husband and I are already big communicators with each other, so we knew that we would still enjoy our time to talk, but we were also looking for an activity that did not involve electricity. 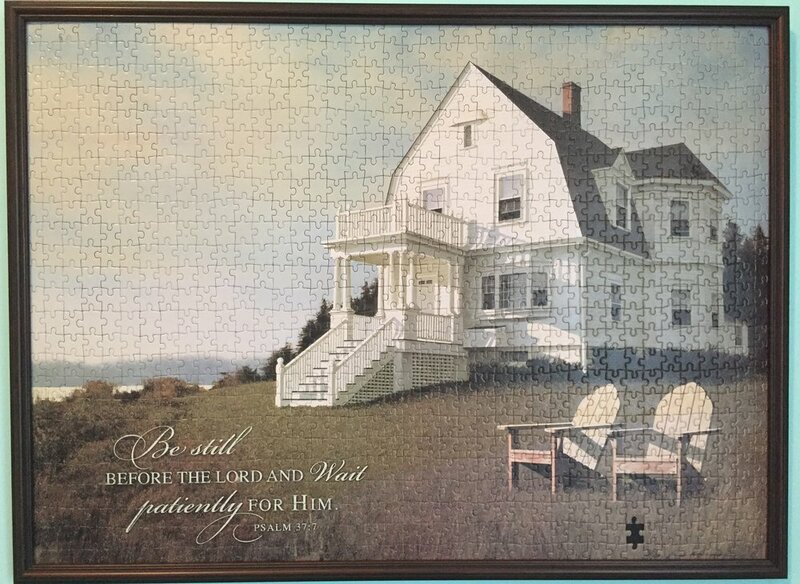 So I went to our local Christian bookstore and purchased a puzzle to keep us entertained. I love writing. Alliteration, Rhyming, Synonyms, Homophones--they all make me happy! I enjoy manipulating sentences and forming various word combinations. Using a thesaurus, cutting and pasting different fragments of words on a screen . . . this is the kind of puzzle that I appreciate piecing together. So when I say that my husband and I worked on a puzzle for three weeks, it was fun to spend time together, but it was truly tedious work! One-thousand pieces that needed to connect and find their home. Or at least the box said it was 1,000 pieces. In actuality, the box contained less--we received only 999 puzzle pieces. Can you imagine? I don’t even like puzzles, and the ONE that I decided to devote my time and energy to is missing the last piece! Disappointing. Frustrating. We searched everywhere around our dining room table. Unfortunately, this blog is not about the parables of finding the lost coin, son, or sheep. We never found that missing puzzle piece. As my husband was getting ready to deconstruct and put away our “finished” puzzle, I said, “NO! I’m framing this thing.” There’s no way I am shelving this accomplishment. There were many invested hours poured into that puzzle. Sure, it’s missing a piece . . . but that only adds to the beauty and perspective of life. I had a choice--I could be upset about the 1 missing piece, or I could be content with the 999 pieces that were given and placed in the right spot. It’s easy to look at my puzzle and focus on the void. Which if you think about it is crazy . . . because it is only 1/1000 of the picture. Yet somehow our human eyes are often drawn to what is wrong instead of what is right. When it feels like something is missing, try to look at all of the other pieces/blessings that are placed in your life. This draws our attention to the bigger picture and allows our hearts to refocus. Contentment creates peace and promotes spiritual growth. It’s so fitting to me that the missing piece in this puzzle sits right near the chairs. It connects to resting--being still before the Lord and waiting patiently for Him. (Psalm 37:7) In the stillness, peace is found.